The State Library of Iowa recently digitized a book of plat maps from of the Des Moines River Valley. This collection of maps was created between 1837 and 1851 and details the land of the developing state of Iowa. Organized by county and township, the details show land ownership, depict the raw landforms, water bodies and natural occurrences, and indicate societal movements of that time. Included in this collection are annual surveys from the late 19th century, published by the Iowa Geological Survey as well as shorter technical papers related specifically to coal in Iowa. These materials are full-text searchable. 95 plat books, published by W.W. Hixson & Co. in 1930, showing land ownership maps for townships in Iowa counties. The maps include some topographic information. Until this time, of the two most widely used early Iowa atlases, the 1875 Andreas Illustrated Historical Atlas of the State of Iowa has been the most readily available in digital format. With this in mind, the University of Iowa Libraries Map Collection has undertaken and completed the digitization of the 202 maps and photographic plates comprising the 1904 Huebinger Atlas of the State of Iowa, complete with zoom and pan capability. Subsequent additions to this collection include early Iowa county landownership atlases. The construction of the State Capitol building of Iowa began in 1871. The State Library of Iowa was built on the second floor positioned in between the house and senate chambers. The library has five floors lined with bookshelves. 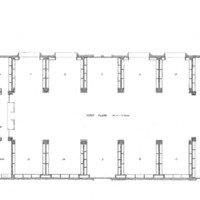 These blueprints are the original proposal for the library's first four floors. The fifth floor is not included in these prints and may have never been created.